Think of it as a summer toddler bucket list. You simply create a list of things you want to achieve with your toddler this summer, ticking it off as you go. Struggling to think of goals to add to your list? Below, you’ll discover some great ideas to get you started. It’s a great idea to start by sitting down together as a family and brainstorming ideas for your summer goals. What would your toddler like to do? Now, obviously they’re likely to make a few unrealistic requests. For example, they may decide they want to meet a dinosaur! Obviously, this isn’t exactly doable. However, you could compromise by takin them to a dinosaur museum or attraction. Giving your toddler some input into what they do will make them much more excited for summer. You’ll also want to take into account the goals other members of the family want to achieve. Sitting down together and discussing what you’d all like to achieve by the end of summer is a great way to come up with ideas. Physical goals are always good to set during the summer. Toddlers have a LOT of energy and they need ways to get rid of it. Physical goals can therefore help to burn off excess energy, as well as ensuring your little one stays healthy. You can set all kinds of physical goals such as making sure they play outside for an hour each day. Or, why not set a goal to go on a certain number of walks together throughout the summer? In terms of life skills, there’s not an awful lot you can teach your toddler that will set them up for life. However, there are a few skills you can aim to help them achieve during the holidays. For example, they could help you to cook, teaching them about preparation and how food ends up on the plate. You could also even potentially start your own vegetable garden which your toddler can help you with. Create a list of the life skills you could potentially start teaching your toddler and then split them down into achievable goals. Mental based goals will help with your toddler’s state of mind. It’s easy to dismiss mental health goals for toddlers, after all, what does a toddler have to worry about? However, you may just be surprised! There’s been an increase in the number of young children who suffer with mental illness. So, starting early and helping to boost your toddler’s mental health is a great idea. It could be as simple as reading new books together, getting out into nature for a while or trying outa new toddler-friendly hobby. Finally, spiritual goals can be closely linked to mental health goals. They include helping others and focusing on self-improvement. Now, obviously your toddler isn’t going to need self-development goals. However, teaching them to be kind to others and volunteering their time is a great lesson to incorporate early into their development. You could set a goal to help out a set number of people throughout the summer and also create your own activities to teach your toddler about kindness. 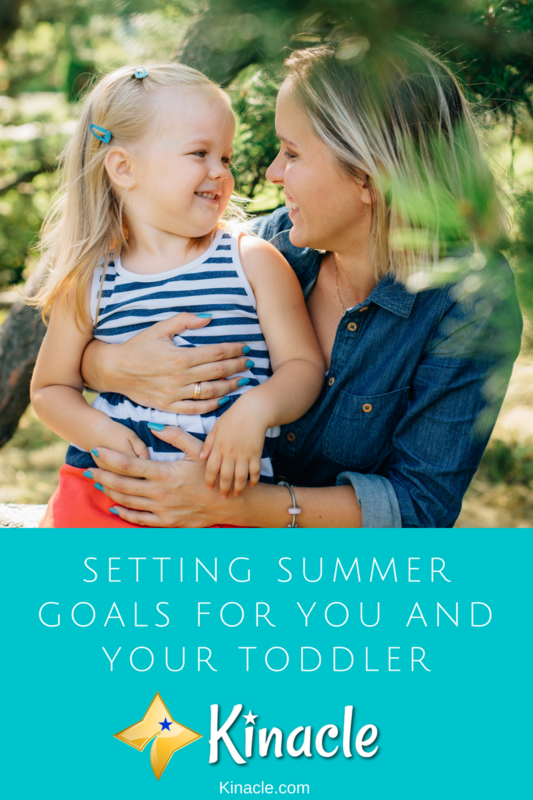 Creating as many different types of goals as you can will help to keep your summer varied and really aid in your toddler’s development. If you want to get the most out of the summer holidays with your toddler, it’s a great idea to learn something new together. Most holidays tend to be spent doing the same thing, or simply taking part in outdoor activities. However, as the summer holidays are a lot longer than most during the year, it’s worth putting that time to good use and setting goals to actually achieve things. You could set you and your toddler just one goal to learn something new by the end of the summer. Or, you could set several small goals you can work towards. For example, you could focus on teaching them a new skill by the end of the summer, such as signing up to a local toddler group. Or, you could aim to teach your toddler a set number of new words by the end of the summer. These are just a couple of examples, but anything which teaches your little one something new is a great idea to add to your summer goals list. There’s so many things you can do throughout the summer. The above is a very small collection of goals you can set yourself and your toddler. Sitting down as a family and brainstorming is definitely the first thing you’ll want to do. This will give you ideas that everyone actually wants to do and it’s a way to get everyone involved. Setting summer goals for you and your toddler is a great way to ensure they stay entertained during the holidays. It also helps you to ensure they actually accomplish something, rather than just playing out in the backyard or watching cartoons!